Just over two years ago, Ros from The More Than Occasional Baker and I came up with the idea of Alphabakes. 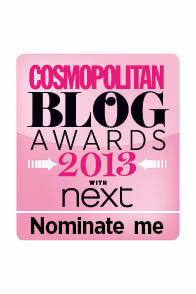 We enjoyed entering different blog challenges and wanted to start one of our own. The idea was born over dinner one night where we excitedly came up with the concept and the name - that we would choose a different letter of the alphabet each month, in a random order, and ask bloggers to make a recipe beginning with that letter or using a main ingredient beginning with that letter. And so Alphabakes was born! We were thrilled by how many people got on board with the idea and sent us entries month after month - sometimes we had as many as 60. Putting together the round-ups is always quite time consuming, particularly because we both have busy full time jobs, but it's definitely worthwhile. We love to see what ideas people come up with - I've definitely come across many new recipes and even some new ingredients I haven't heard of before! You even did us both proud when we had some particularly difficult letters like Z. We've now come to the end of the alphabet with U being the last letter - we started with L, for anyone who can remember that far back! Well, we have some good news for all you keen Alphabakers - we're starting again! I'm sure there are some people who haven't taken part every month, or only came across Alphabakes when we were half way through the alphabet; equally I know it's hard to choose just one (or two, or three) recipes to make and there were plenty of others that you could have made when we had that particular letter. So on April 1 we will begin season 2 of Alphabakes - again selecting the letters in a random order. Of course, it will be a little easier this time around; if you can't think of something beginning with that letter, just have a look at the round-up that we posted the first time around. Of course, if you took part last time, you might want to challenge yourself to make something more unusual -or try out one of the recipes from another blogger that we included in the roundup. Of course, we're not going to make it quite that easy for you to start with, and we have a little surprise up our sleeves for April... watch this space! 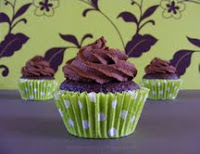 We had a good selection of ingredients and bakes beginning with A; for instance these Chocolate Cupcakes with Avocado Frosting from Elizabeth at Elizabeth's Kitchen. We also had quite a few savoury bakes. We had almost 50 entries this month with a few bread entries as well as cakes. I sent in quite a few entries myself including some bacon brownies which are best never mentioned again.... on the other hand these mini banoffee pies by Sarah from Maison Cupcake look delightful. We had to wait a long time for this popular letter to come up which gave you plenty of time to think of ingredients other than chocolate! We had chai, cherries, crepes, coffee, cinnamon and these Candy Corn Pumpkin Blondies by Stuart from Cakeyboi. This month introduced me to a new ingredient I hadn't heard of before, dukkah. And if you're ever wondering what you can do with dates, look no further than the round-up here. One entry that stands out for me this month was Kit from i-Lost in Austen with this beautiful hazelnut dacquoise with chestnut cream. I needn't have been worried that people would use e for eggs in a cake, as we had much more imaginative recipes and ingredients. I was particularly proud of my Elvis Cupcakes - banana, peanut butter and bacon, apparently Elvis's favourite sandwich filling. Not everyone was keen on the caramelized bacon though! We have been very lucky with Alphabakes to have been able to work with some great companies and brands and are very grateful to the friendly PRs who have provided prizes for the occasional challenge. This month was one such challenge when we were able to offer a prize. 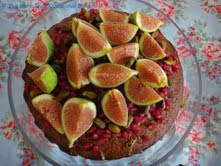 For F, I tackled the notoriously difficult fraisier, which turned out a lot better than I expected, while Ros at The More Than Occasional Baker made a fig, yogurt and walnut cake, with pomegranate and pistachio. 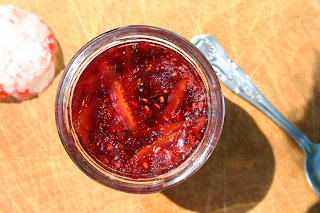 wild strawberry, rose and purple gooseberry jam from Dom from Belleau Kitchen. We actively discouraged entries using icing for the letter I this month which made it harder for some people, but we still had plenty of great ideas, and a fabulous prize from Dr. oetker. However we had to make an exception and allow icing as the key word after we saw this fondant decorated cake by Elizabeth from Elizabeth's Kitchen. For the first time we seemed to have some of you stumped… or maybe you were busy in the run-up to Christmas, I know I was. We didn’t have quite as many Alphabakes entries this month but we still had some great entries. I also want to give a hat tip to both of our mothers - especially as it's Mothers Day today. They have been among the biggest supporters of Alphabakes - my mum has taken part every single month apart from this one, as she made her U entry long ago then accidentally deleted the photo before the challenge came up with that letter! Neither of our mums have blogs, so they email us photos of what they have made, and Ros and I love to be able to showcase their skills. After all, our mums were the ones who taught us how to bake! This month is a good example: Ros's mum made this raspberry jam tart and my mum made a jam and coconut sponge. Not that I want to keep showing off what Ros and I made, but I'm particularly proud of our creations this month. 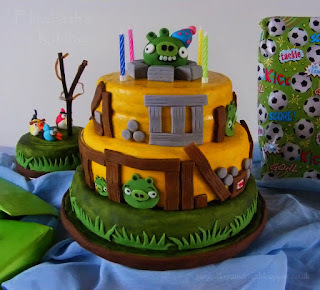 I used Kit Kats to make this pigs in mud cake, and it's the most popular post of all time on my blog, with about five times as many hits as the second most popular post. Ros's Kinder Bueno cupcakes are also a 'must try' and look beautiful (and probably taste even better!). This is where it all started! L was the first letter for the Alphabakes challenge and we weren't sure how many people would take part, and if we would have anything other than lemon entries... we needn't have worried! 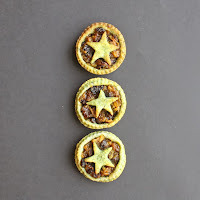 There were 33 entries- not bad for a brand-new blog challenge - and lots of lovely lemon but some other more unusual entries too. 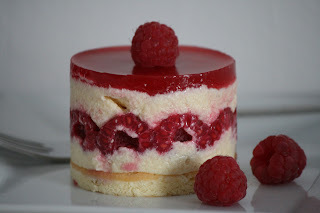 Laura at lauralovescakes made a stunning Lychee, Rose and Raspberry mousse cake. A true labour of love which took several hours to make but I'm sure that you will agree that it's worth it! A nice easy letter with a myriad of possibilities...far too many for me to mention so you will just have to revisit the roundup. 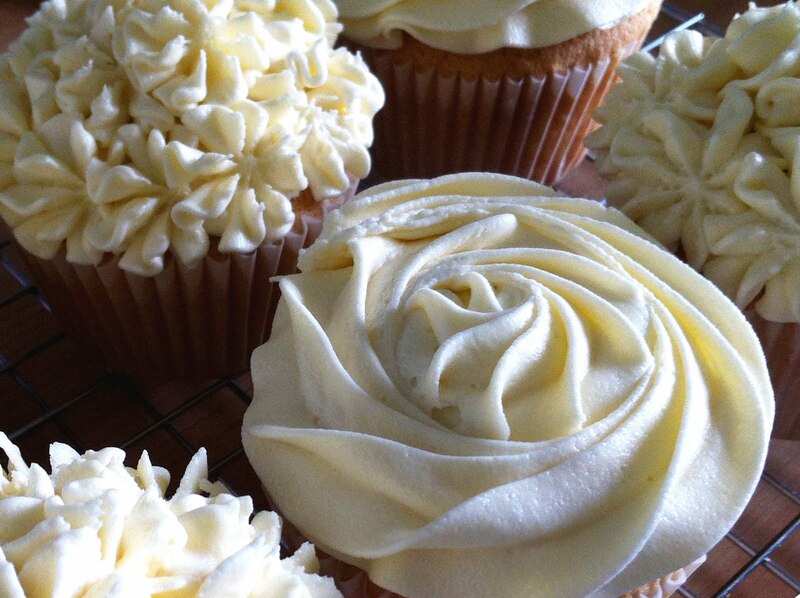 What do you think of these Mint mojito cupcakes from Olivia from Liv a Little Bakery ? The weather getting colder was just right for this round-up full of nuts and nutella; there was some fruit as well and quite a few Nanaimo bars - I thought I was being original but several other people had the same idea! These ones are from Helene from I Cook with Butter. As well as orange, there were quite a few entries with Oreos - my favourite biscuit, which works really well in cakes and cheesecake. And an introduction to something new, gulab jamun in this white chocolate, orange and gulab jamun cheesecake from Chintal of Chinskitchen. Gulab jamun are deep fried balls made from milk solids that are soaked in a sugar syrup flavoured with cardamom and rosewater or saffron before frying. Chintal’s cheesecake recipe also uses cardamom powder for extra flavouring and the finished result looks very pretty. 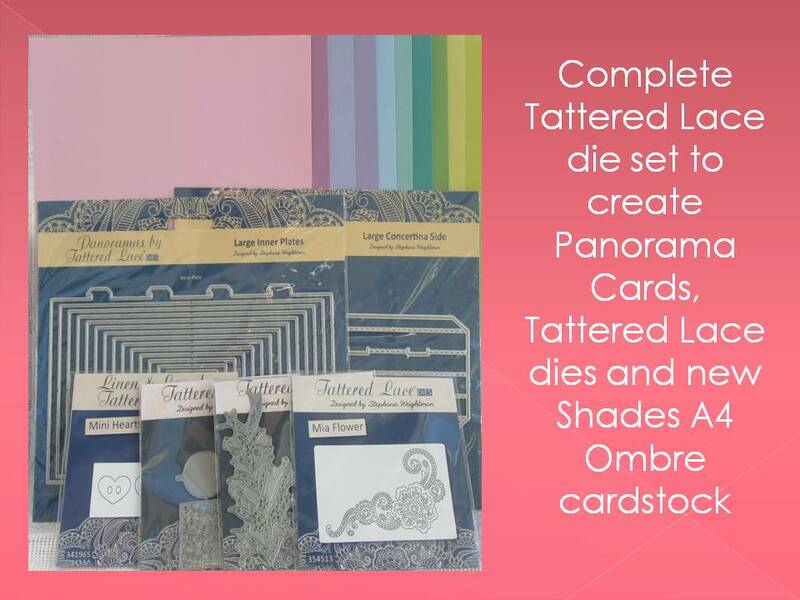 A wonderful prize from Charbonnel et Walker made this one of our most popular challenges, so it took a long time to do the round-up! 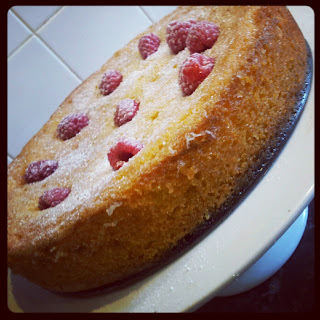 This Raspberry Margarita Polenta cake was sent in by Becks aka LilMsSquirrel of the 366 Recipe Challenge. Polenta is a great ingredient for baking as it makes the cakes gluten free; in this case Becks added lime juice and tequila to give it a bit of a kick. I’d love to try this! A much harder letter this time but another chocolate giveaway, provided in this case by Hotel Chocolat. We had Queen of Puddings and quiche, quince and quark, among others. Mel atSharky Oven Gloves made a Silverbeet (Swiss chard) and Feta Quiche. We had some nice seasonal ingredients like rhubarb and raspberries, and these Rose Lemonade Scones from Karen from Lavender and Lovage. The scones are made with Rose Lemonade, flour, salt, sugar, creme fraiche and milk. If you can't source rose lemonade, you can use regular lemonade and add some rose water or essence. This seems such a long time ago now! There were several festive takes on the letter S including spices, snowballs, and this Santa bread from Vivian Pang Kitchen. A nice easy letter with lots of entries, including treacle, toffee apple, tiramisu and trifle. Becky from Mintcustard sent in these chocolate tiffin biscuits that her mum used to make to keep them happy! This was the last letter we had, and it wasn't easy - unsurprisingly there were an awful lot of upside down cakes, but using all kinds of ingredients and they all looked great. There were also a few more unusual entries like my Umbongo cake! Check out these Upside Down Toffee Apple Squares by Suelle from Mainly Baking. 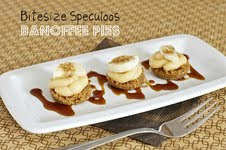 It contains apples, hazelnuts and mixed spice and looks really light and moist. A Victoria sponge is arguably the most classic kind of cake there is, and vanilla is one of the most traditional flavours, so it's not surprising that both of those came up a fair bit this month. We also had quite a few Viennese fingers and whirls, and these White Russian Cupcakes from PiggyBakes which contain Vodka and Kahlua. We decided to make things a little bit easier for you as we knew this would be the most difficult letter, so deliberately waited until December to choose X, so we could accept Xmas entries. 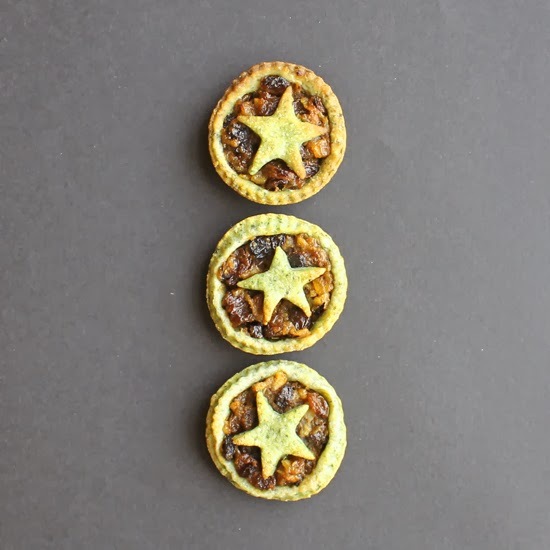 It's impossible to pick a favourite but something about the photograph here appeals to me; Kate from Veggie Desserts has made these Mince Pies with Spinach Pastry. 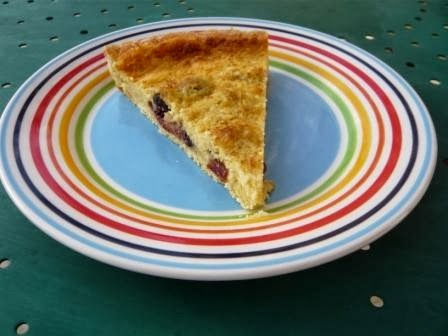 Most people seemed to find this a lot easier than X the previous month; yogurt featured in a lot of entries; among the non-yogurt related entries was this by Jean from Baking in Franglais with a Yorkshire Curd Tart with cranberries. We had lots of zucchini entries, unsurprisingly, quite a lot of zest, some zebra cakes and a zombie graveyard. 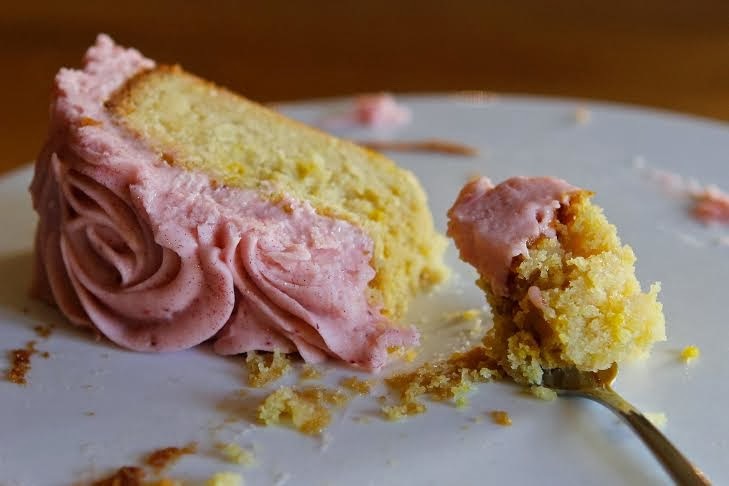 Kate, aka the Gluten Free Alchemist, made this zesty drizzled lemon cake with roasted strawberry cream cheese frosting. It's been brilliant fun running Alphabakes with Ros over the last 26 months and I'm looking forward to the next 26, and I hope you are all looking forward to taking part! I'm so glad you're starting again, partly for very selfish reasons because I only started seriously blogging in summer 2013 so I only had a few months of AlphaBakes. I'm really looking forward to the next round and hope everyone else is too! What a brilliant entry. It was always such a fab challenge to look forward to and I only think I missed 2 or 3. Can't wait to see what you're up to for the next month!! So glad you're carrying it on! i had forgoten how many wonderful,and different cakes had been made. and how popular the alphabakes challenge was!!. well done. Looking at all these amazing bakes, I feel quite sad that I only came in at the end! Never mind........ another alphabet awaits..............!